Please directly go to our new store to make the purchase. All of our hot air rework stations contain built-in air pumps. Built-in sensor for steady temperature control at any air flow pressure. Precise airflow and temperature adjustments. Good for QFT, SOP, PLCC chips and other components. Combined tool for both through hole and surface mount components, LED displays. 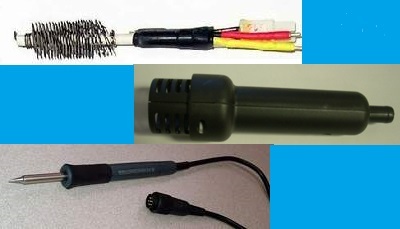 Comes with a sharp tip regular soldering gun, a hot air gun with two nozzles. Rework tool that combines a heat gun and soldering station. It is compact and easy to operate. Hot air pencil works great for small components and high density circuit boards. Soft and rotating hot air make it best suitable to work with high density circuit board, like cellular phones, etc. LED display. Small size and light weight. Comes with 3 nozzles, 6mm, 8mm, 12mm diameters. 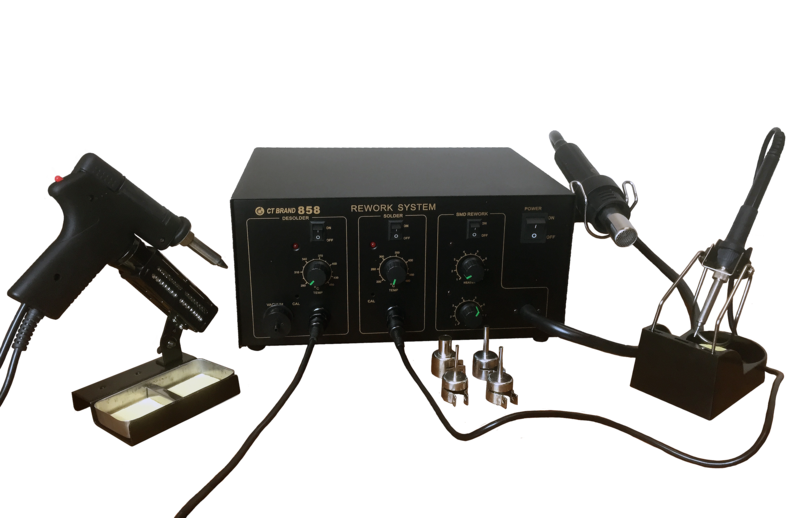 3-in-1 rework stations include a hot air gun, a soldering iron and a desoldering gun. This hot plate can be used to preheat a whole board for repair or parts removal. It can also be used to build small circuit boards with manual profile control. Fast heat up, 10 seconds to reach 250C. Built in temperature sensor for stable temperature control. Hot and cool air selection for chip preheating or cooling. Tip temperature: 320C-480C. Pump: Diaphragm. Vacuum pressure: 600mmHg. Tip to ground resistance: <2Ohm. Tip to ground potential: <2mv. 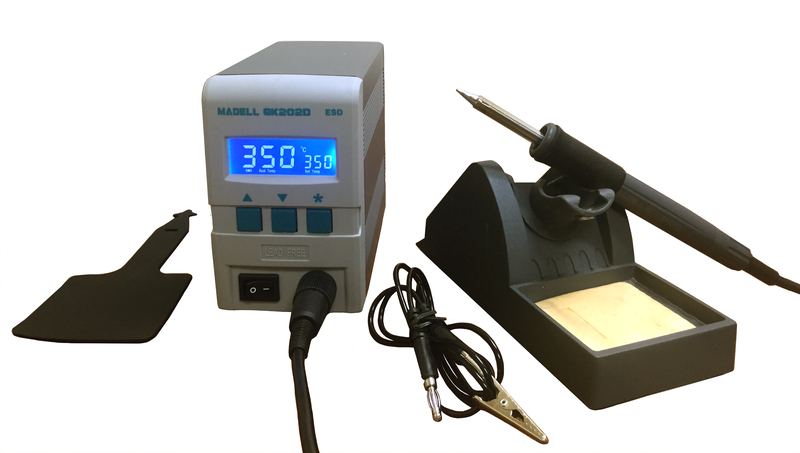 Intelligent, high performance ESD soldering station. Fast heating up, reaches the required temperature in seconds. Hot tweezers with SD-04B soler station base. This item is hot tweezers only. Soldering station is not included. It can used Madell QK936, and other rework stations. 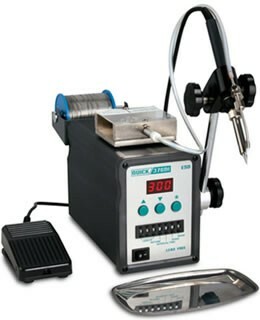 This package includes a 8502 rework station with 2 nozzles, hot air gun and PCB fixture and a preheat hot plate. This package includes a 850D rework station with 8 nozzles, hot air gun and PCB fixture and a preheat hot plate. Heating the top and bottom sides of PCB's at the same time used with a hot air rework station and QUICK853ESD.Adjustable to suit different PCB sizes. This package comes with a large PCB frame. Fixture used to hold a PCB board. Adjustable to suit differenct PCB sizes. The base is not included. Large frame: 10½"x13", height 4½"
Small frame: 5½"x6", height 4½"
Heating power 400W, 130mmx130mm effective heating area, 50°C to 350°C. 5X, 8X magnifying lamps. Automatic solder feeders. Available models for 0.6mm, 0.8mm solder diameters. Solder smoke absorbers for a cleaning working environment.